Deftones are back with their self-named album, that follows the “Grammy winning”one : White Pony. In this very good album they mixed some riffs of “Adrenaline”, with melodic tempo of “White Pony”, taking some example from “Change” and “Digital Bath”. Guitar plays alone in a schizopherinc “Hexagram”, and then explode in a powerful rhythm that let you move your head up and down (ehehe)...a strange balance between melody and anger. Chino Moreno is filled up with emotional embalance...he trys to express his inner side to the listener, and he makes it in a wonderful way. In “Needles and Pins” we can appreciate the wonderful work of Abe Cunningam, precise and never invasive....he sets a perfect drum session, chosing carefully the right sound. “Minerva” is the video-song. Slow and deep, powerful only as Deftones can make it....pathos and anger controlled by the voice of Chino and by the grind industrial guitar of Stephen Carpenter....there is a wonderful melodic line when he said “We’re the same numb and it brings knees to the earth...” stopping the song in each word, pulling his voice and creating a line of junction between every rhyme. “Good Morning Beautiful” starts with a collapsed sound, mixing together a nice and “round” big jam with a dry guitar, heavy and unforgiving when it comes to being loud. One of the most beautiful song is “Lucky You”. Simply brilliant..Chino sings over an electronic base, with some samples taken from the ’80 and from Depeche Mode, here the second voice gives an unknown echo...making a strange sonorous atmosphere. Very nice and “Deftones style” is “Battle-Axe”. It starts with two notes, then Carpenter explodes with a grind and monophonic guitar...changing tonality during the main rhyme...where Chino pulls his melody..then he returns back to the powerful and sad sound of Deftones, (Deftones infact means Deaf Tones...a kind of silent sound). In “Anniversary Of An Unteresting Event” we can listen also piano (? )...in a strange song: calm, slow, really slow..maybe too much...but it’s really beautiful,i think that it’s pure sound. 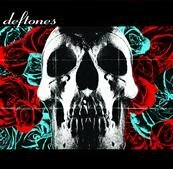 “Moana” closes the whole tracklist and takes you to the real origin of Deftones...monophonic guitar...a big drum work and melodic voice.....sincerely this last song is not my favourite, except for the massive use of effect in Chino’s voice and on the guitar.. I can define their sound ...sad and full of pathos...isn’t powerful...is better: powerful and slow..you can feel the anger, the sadness, and you can mix it with music...in a rare experience...this fills you slowly and deeply with time, song after song....it’s incredible. They aren’t too simple to listen, cause Chino divide the rhyme in various pieces...linked by his voice like and endless melody.